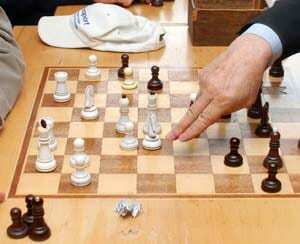 Pune-based International Master Akshayraj Kore defeated fellow-Indian Grandmaster Deepan Chakkravarthy and joined the leaders with 7.5 points after the ninth round of the SDAT-RMK 4th Chennai Open International Grandmaster chess tournament om Tuesday. Akshayraj joined the trio of leaders Aleksandrov Aleksej (Belarus), Yu Ruiyuan, Zeng Chongsheng (both China) at 7.5 points. Behind the leaders at 7.0 were GMs Oleksienko Mikhailo, Kravtsiv Martyn (both Ukraine), SP Sethuraman (India), Marat Dzhumaev (Uzbekistan), Hoang Thanh Trang (Hungary) and John Paul Gomez (Philippines), among others. A fighting draw with Sethuraman in the second board fetchedc Ruiyuan a Grandmaster Norm. The second Norm of the day was achieved by Maharashtra player Shashikant Kutwal who defeated veteran Grandmaster Dibyendu Barua. Kutwal posted his fourth International Master Norm and now requires an ELO rating of 2400 for his International Master title confirmed. The top board game between Aleksej and Mikhailo turned out to be hard battle for supremacy. Aleksej pressed all the buttons, but Oleksienko hunted white's extra pawn in the 'b' file, and fetched himself a draw after 60 moves.